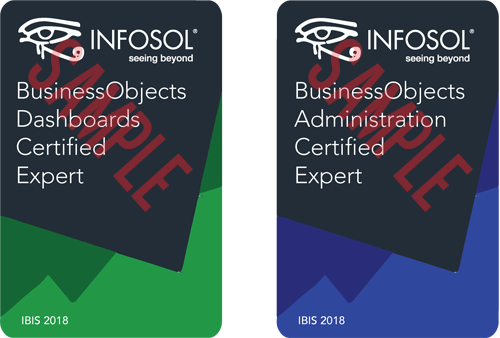 At this year’s IBIS you can become BusinessObjects Certified. We see you. We hear you. And now we want to give you a badge that you can wear proudly. 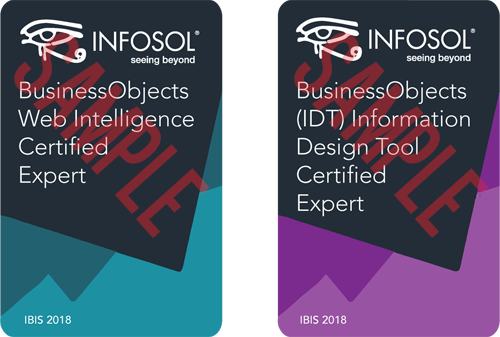 IBIS not only offers the best BusinessObjects training on the planet, but now you can get certified in a variety of different BusinessObjects disciplines and be recognized for your expertise. For those passionate about InfoBurst, we did not forget about you. As always, IBIS provides you the chance to become an InfoBurst Certified Expert when you participate in the InfoBurst Experience during the Pre or Post Conference. Here are the three easy options to become certified. Upon successful completion of the certification you will receive a certificate along with digital badges that you can use on your signature, resume and social media profiles. You will also be included in the InfoSol registry of certified experts and receive a special recognition memento. The cost for certification is included in your IBIS admission! To sign up for these certification programs, register via the form below and we will provide a certification package for you at the IBIS registration desk when you check-in for the conference. Sign Up to Get BO Certified at IBIS!